Return to the world of the Liveships Traders and journey along the Rain Wild River in the third instalment of high adventure from the author of the internationally acclaimed Farseer trilogy. The dragon keepers and fledgling dragons have discovered a route to the lost city of Kelsingra but there is one problem: they need to be able to fly to cross the treacherous waters and enter the fabled city. At first, only a few dragons are willing to try – the others are either too ashamed of their deformed wings and feeble muscles or too proud to risk failure and humiliation. But the rewards waiting at Kelsingra for those brave enough to take to the air are worth more than they could possibly imagine. This was a city built for dragons and their keepers. Alise Finbok is overwhelmed by the treasures she finds there, and spends hours carefully uncovering wonder after wonder, recording her findings for posterity. She knows the knowledge will change everything the world thought about dragons and the Elderlings. Yet rumours of the city’s discovery have floated down the Rain Wild River and reached envious ears in Bingtown and beyond. Adventurers, pirates and fortune hunters are coming in droves to pillage what they can from the city. Will the dragons, only just finding their strength, and their keepers, who are changing in their own mysterious ways, be able to fend them off? 5.0 out of 5 starsAnother great read! The story continues of the dragon keepers reaching their destination, and sets it for the conclusion though it will leave you wanting to quickly get the next book to find out what's happens next. If you liked the other books in the series, you won't be disappointed with this one. I continue to enjoy the adventure through the Rain Wilds. There are lots of characters in this part of Hobb's series, however, I am keeping up with them all. Sometimes I long to just stay with one or two characters for a long time, like with the earlier stories about Fitz, and even the Live Ship series. Just a personal preference I believe. There are times though when I feel things are being repeated, and drawn out more than they need to be - once again, probably a personal preference. No matter - I love this story and find Robin Hobb is a very talented storyteller. It took a long, long voyage down the River Wild before the dragons reached the ancient city of Kelsingra. But... they're still not there. "City of Dragons: Volume Three of the Rain Wilds Chronicles" is very much a "middle" book, with Robin Hobb juggling many established plot threads without actually bringing resolution to anything. It feels sort of like the first half of a book -- there are some intriguing scenes and potentially exciting subplots, but by the end nothing much has actually happened. The dragons and their keepers are close to Kelsingra, but it can only be reached by air -- and only one of the dragons is able to fly for any significant distance. The city itself turns out to be a wondrous place, filled with strange lingering magic and beautiful buildings -- and the new Elderling teenagers begin to discover more about themselves and their new role. Not a lot actually HAPPENS in "City of Dragons." Robin Hobb does introduce a couple new subplots into the half-dozen she's juggling around -- the Chaldean conspiracy, Malta's pregnancy, the love triangle around Thymara, the new Elderlings, Alise ditching her old life, Sintara being prissy and prideful, and the exploration of Kelsingra. But Hobb seems to be slowly building these plot threads towards a climax, and that's what most of the subplot development is -- slow build. It's like we're in the middle book of a trilogy. However, the lack of travel woes in "City of Dragons" allows her to flesh out the history of Kelsingra, and infuses it with an haunted, otherworldly magic that really entrances. And a couple of the subplots have a faster, more thrilling air to them, such as Malta's encounter with a pair of Chaldean murderers, Selden's imprisonment, or the ever-vile Hest's schemes and dilemmas. 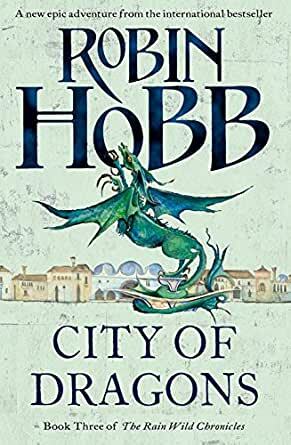 Hobb also reintroduces some familiar characters -- Tintaglia the dragon and Malta the Elderling among them -- and starts integrating them into the established cast of grizzled, good-hearted sailors, outcast teens and the often-grumpy dragons. The downside of the characterizations is that I'm getting a little tired of Thymara and Tats' teen soap opera, and the question of who is hooking up with whom. "City of Dragons: Volume Three of the Rain Wilds Chronicles" isn't a bad book, but it is a rather lightweight one, with several subplots being set up for the grand finale. I find that I get hooked deeper into Robins world the more I read, I an down to my last book and sad that I now need to find another Author.